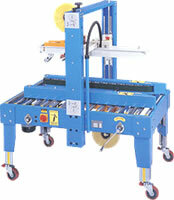 Box strapping machines are widely used to package all kinds and sizes of boxes including corrugated boxes and PP boxes. Semi and fully automatic box strapping machines are equipped with belt and roller drive and a mechanical tension adjuster for high speed strapping. Box Strapping Machines allow easy loading and unloading of strapping rolls and very carefully and efficiently strap various boxes. The number of boxes strapped, depends on the technical specification and size of the strapping machine. Some strapping equipment consists of electro magnetic clutch transmission for increased strapping speed and has an adjustable cooling time and strap tension and length for better performance. Carton Sealing Machine, Carton Sealer, Sealing Machine auto carton sealer is suitable for carton packing, the carton sealing machine can be used for single use or production line. It adopts adhesive tape to seal carton, economy and fast, easy adjust. It can finish the sealing both top and bottom. Also you can adjust the height and width for different cartons. Cartoon Sealing Machines are mainly used in Pharmaceutical, Food & Beverages, Chemical and Cosmetic Industries. Carton sealing machines packaging machinery are used for sealing of cartons, boxes of various sizes and shapes. Most Cartoon Sealing machines are equipped with top and bottom double belts for transporting both heavy as well as light cartons. The cartons are sealed at the centre with the help of two adjustable guiders and mobile layers. V shaped plating head helps to keep the tape straight while sealing and allows for consistent sealing. The compact size and easy operations of these machines, makes them usable in any working space. Many Carton Sealing Machines can integrate with other packaging devices such as auto strapping machines for higher output. The output or the number of cartons sealed depends on the type of automation of the machine and its technical specifications. Shrink wrap machines make use of plastic to effectively seal a container or product by tightly surrounding it. Vacuum shrink wrapping can prevent bacteria form entering the product and also protect them form wear and tear during transportation. The process involves tightening a thermoplastic film around the product and shrinking it by heat. It also helps to add strength to the stack, making it dust, water and tamper proof. Shrink Wrapping machines are used for pharmaceutical packaging. Certain shrink packaging machines perform the dual function of shrinking and sealing. There are various types of shrink wrap machines used according to the product or material being wrapped. L-Bar sealers are used to pack products with the help of electricity rather than heat. Heat guns are used to wrap blister packs. Vacuum sealers are used to shrink wrap pharmaceutical, medicines. Suitable for products that require visual inspection of shrink process. Economical compared to conventional packing. Multiple packs can be shrunk simultaneously to save time and energy. Cartoning Systems are servo driven, feature small footprint design and package a wide variety of products including blisters, bottles, patches, vials, and syringes. Ideally suitable for online cartoning of blisters, bottles, vials, vial and ampoule, bottle and dropper, tubes, etc. Suitable for tuck-in as well as glued type cartons. Online leaflet folding and insertion/pre-folded leaflet insertion, batch coding, embossing and empty carton rejection available.